Well-drained soil with plenty of compost dug in. In clay soil, use raised beds. Sun or partial afternoon shade. Yes, becomes dormant in winter. Use mulch to keep soil nutrient levels high. Mulch with rich compost in late winter, and add more mulch in summer to deter weeds and keep soil moist. Can be grown from seeds, but it is faster to grow from a dormant crown, or by cutting away and replanting a division taken from an established plant. Make new plantings or move old ones in spring. 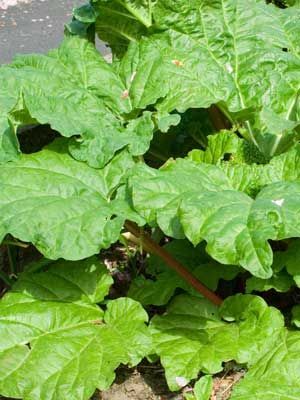 To make rhubarb stems longer, cover plants with bushel baskets or other large, breathable containers for one month in spring. Use a sharp knife to cut new stems in spring as they reach 14 inches long. Discard leaves, which contain dangerously high levels of oxalic acid. Stop harvesting in early summer, and allow plants to grow freely the rest of the season. Trap slugs with beer, hand pick them in rainy weather, or spray them with caffeinated coffee first thing in the morning.